Today’s Final Jeopardy answer (in the category African Cities) and game statistics for the Wednesday, October 24, 2018 game between Rock Wayda, Hannah McIntyre, and 3-day champion Erik Agard. Today’s Final Jeopardy answer (in the category Old English Literature) and game statistics for the Tuesday, October 23, 2018 game between Patrick Healy, Traci Clark, and 2-day champion Erik Agard. 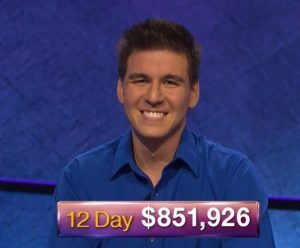 Today’s Final Jeopardy answer (in the category Places in the News) and game statistics for the Monday, October 22, 2018 game between Joanna Rom, Mike Jenkins, and 1-day champion Erik Agard. Today’s Final Jeopardy answer (in the category Sports) and game statistics for the Friday, October 19, 2018 game between Herschel Purvis, Erik Agard, and 5-day champion Alan Dunn.